The Cobalt Code Software Review - Scam or Not? Check !! The Internet is full of fake trading programs and in today’s article, you will read The Cobalt Code review which assures you around $15000 a day. The 52 minutes Pitch video of this trading software start with testimonials of the The Cobalt Code users. In which all of them shared how much they have earned using it in a day, a week or two weeks and the amounts be like $90000 in 5 days, $17000 in one day, $23900 in two weeks and so on. After that, Grant Stone take over and start explaining about his fake trading software and giving you lots of reason why you must start using it. Frankly speaking, Don’t fall for it guys, as this trading software is a SCAM. 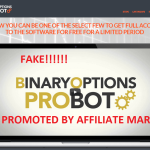 While doing a deep research about The Cobalt Code Software, we found lots of proofs which forced us to call this binary option a SCAM. Later on you will read about all of them, but first, it is vital to know about this trading software. What is The Cobalt Code (Claims by Cobalt Code Software)? The Cobalt Code Software is a recently launched binary options program created by Grant Stone, who call himself Cobalt Multi-Millionaire. Two years ago, Grant was a mid-level worker in the cobalt mines of Madagascar and was not happy with his salary. So he started looking for a way that can help him in earning enormous profits just by using this simple metal named as Cobalt and finally found it and it is The Cobalt Code System. With the support of this software, he as earned so much money that he can spend in 17 lifetimes. Even he also helped lots of ordinary people to turn them into millionaires. Now he wants to give chances to more people so that they can also earn a high profit using his trading software. According to Grant, The Cobalt Code system is 100% automated, and you just need to click on the button for start making profit. Any ordinary guy with little knowledge of using a computer can make thousands just in few seconds. 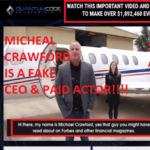 No doubt the story of Grant Stone sounds very promising and real, but the truth is that it is a SCAM and they targeting some ordinary people who don’t know much about trading and want to become rich. So, if you’re the one who received the email from this fake trading software just ignore it. Why is The Cobalt Code Software SCAM? Grant Stone, who call himself Cobalt Multi-Millionaire, is a fake guy. When we tried to check about him on the internet and popular financial magazine we didn’t find a single page who have mentioned his name. The question is, if he is a multi-millionaire, then why there is no information about him across the internet. Also, when we decided to search his name on Google, we got one Wikipedia page of Grant Stone, but he is radio presenter at Faster Than Light Radio Show. Now this forced us to think, that something is there which he is hiding from us. In the video presentation, point come when Grant mention that he has made around $217.46 millions in last 11 month. Now this statement is a big lie, and we have confirmed this thing by checking the website registration of this trading software. By checking the domain registration details, we found that the domain of the official website was purchased on 19 April 2016. Now again question raised in our mind that if the site of The Cobalt Code software is developed around four months ago, then from where all these 23 ordinary users including Grant Stone earned this much profit? If you check the official website of The Cobalt Code software, then you will see a section where you will find that this trading software is trusted and verified by some big banks. Now this is an entirely misleading statement. We all know very well that big banks like Bank of America, Citi Bank, Deutsche Bank, HSBC, and Santander will never be associated with any auto trader software to make a profit. We have also checked the association between these big banks and The Cobalt Code app and didn’t find a single endorsement. Now, this confirms that Mr. Grant is again sharing misleading information which is a terrible thing. How many times we have shared this in our reviews that it is impossible to earn this type of huge profit in one day using binary options trading software. 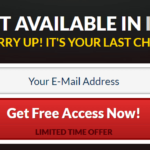 These types of offers are provided by fake trading software just to grab the attention of the innocent users who don’t know much about these scammers. So it is highly recommended to stay away from binary trading software like The Cobalt Code app who assure you around $15000 or more profit a day. So guys, it was all about The Cobalt Code scam. We have provided you lots of proofs to call The Cobalt Code system a SCAM. 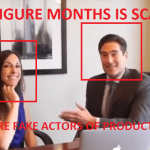 In our research, we found that Grant Stone, who call himself the owner of this trading software, is fake, even some users who provided their testimonials are fake actors who provide fake positive reviews just for $5. 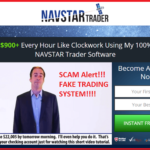 Even to attract users Grant Stone made lots of false promises about his trading software. Now we would like to ask you that, do you want to invest in this trading software which gives us not a single reason to count it as genuine trading software? If yes, then go ahead. 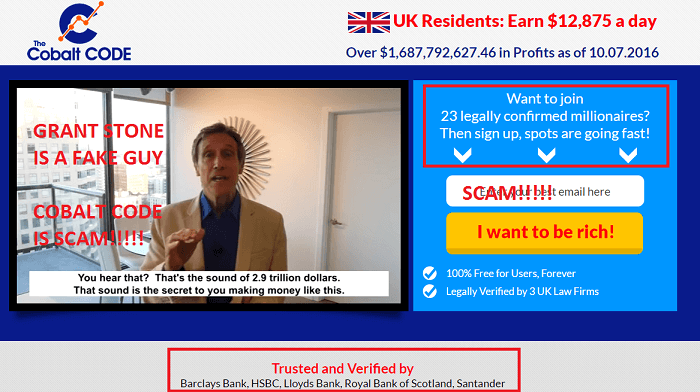 You can find many similar scams on our Binary Options scams page. But in our opinion, The Cobalt Code is a SCAM, and you need to stay away from it. 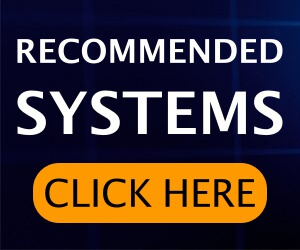 You can find most trusted and legit binary options at your Recommended Signals page.